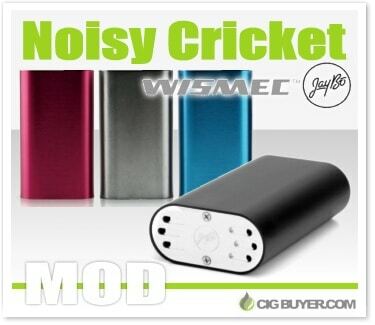 The highly popular Wismec Noisy Cricket Mod (by JayBo) is now available in multiple colors. It may look like a boring mechanical box mod, but looks can be deceiving. This unregulated device is powered by dual 18650 batteries run in series, offering twice the voltage! It’s ideal for high-power coil builds and includes unique touches such as a PEEK insulated SMPL style firing button, precision engineered aluminum alloy body, hybrid 510 adapter, special linkage set and large bottom vent holes.